We are pleased to announce that we now have the English Website about the JAPAN AIKIDO ASSOCIATION (JAA). 1.”NEWS”, 2.”About the JAA”, 3.”What is Aikido?”, 4.”For members”, 5.”Contact Us”. 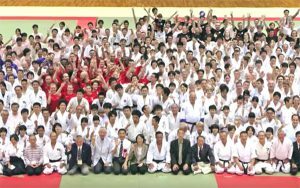 We strongly hope that people all over the world can gain a better understanding about Tomiki Aikido and the JAPAN AIKIDO ASSOCIATION. We are looking forward to seeing you at a Dojo, and practicing together.